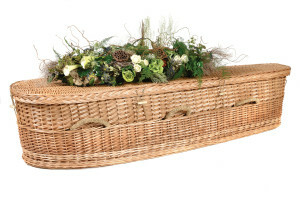 Traditional wooden coffins are giving way to greener, cheaper or more quirky alternatives. Soft wool or natural wicker, cardboard or bespoke sculpture, the choice is yours. Coffins were originally carved from hard woods. These have now become more expensive and difficult to source, so wooden coffins are now often made of chipboard veneered to give the effect of solid wood. Likewise handles and nameplates are made to resemble brass but are often plastic. These materials can pollute the atmosphere when cremated. There are now many varieties of coffin available which do not try to recreate the look of solid wood and are often a more eco-friendly alternative. 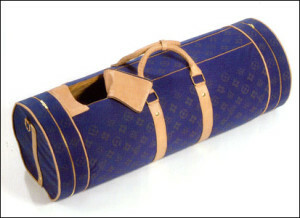 For example, you can source a handcrafted wicker coffin, or even a woolen coffin. These materials are strengthened and lined so that they are as effective as solid wood for carrying purposes, but will burn or decompose more readily and with less impact on the environment. The Ecopod is alternative both in shape and colour, providing a modern impact along with ecologically-friendly materials: the pod is made of recycled paper and will decompose naturally once below ground. It is now possible to create a coffin that will reflect your interests and character, in designer shapes and colours. Market leaders in this field are building coffins in shapes including aircraft, cars, animals and even sports bags in the colours of a favourite team.